Flowers that bloom in winter—for many parts of the U.S., it's hard to believe. That's why hellebores have been a staple of ornamental gardens for generations. Their unique bloom time, combined with a soft, sophisticated colour palette, makes them appealing to gardeners with aspirations of an all-season display. Fascinating hellebores are often seen popping up through the snow, and Wow! Hellebores are no exception. These incredible flowers will provide beauty in the garden when most other perennials (and even bulbs) are still soundly sleeping. And better yet—they'll keep on blooming for months. 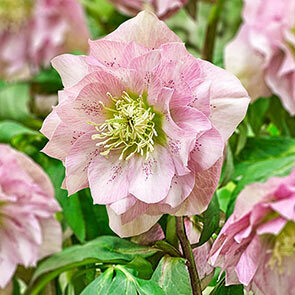 Hellebores are drought tolerant, deer resistant and quite resilient. Even when battered by winter weather, a few rays of filtered sun are all they need to revive. Hellebore foliage can vary in appearance and, in warmer climates, will remain year round. Wow! 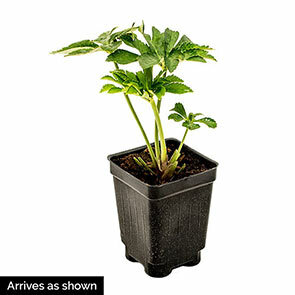 King-Size Hellebores have glossy, fine-toothed leaves that create a nice ground cover. When new foliage and blooms appear, just trim back the previous year's foliage for a cleaner look. It's not often a plant cultivar comes along that redefines its entire genus. 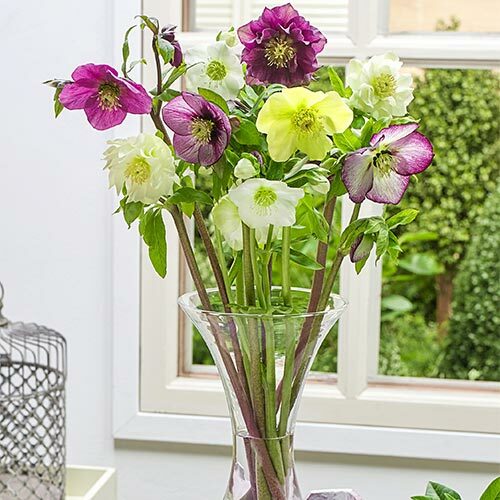 So, it's not surprising that "wow" is the first word we thought of to describe these incredible king-size hellebores. Their height and flower size are unmatched by any other— making them even more eye-catching as they hover over the late-winter landscape. Breck's Wow! Hellebores are the result of over 50 years of careful breeding work. Single and double blooms up to 4" across will stand tall and strong atop 24-28" stems. This makes them better for cut arrangements than traditional hellebores— just one more reason to love them! For our friends at the van der Meijs nursery in Geldern, Germany, hellebore breeding is a passion—and the family business. Three generations of van der Meijs hybridizers had a hand in creating these remarkable king-size hellebores. But offering them to home gardeners is not what they originally had in mind. Back in the 1960s, their objective was different—to develop a bigger, taller hellebore for the cut-flower industry. They started with a Helleborus niger cultivar called 'Christmas Glory', and their breeding efforts eventually resulted in bigger, more floriferous plants. They could have stopped there, but we're so glad they didn't. 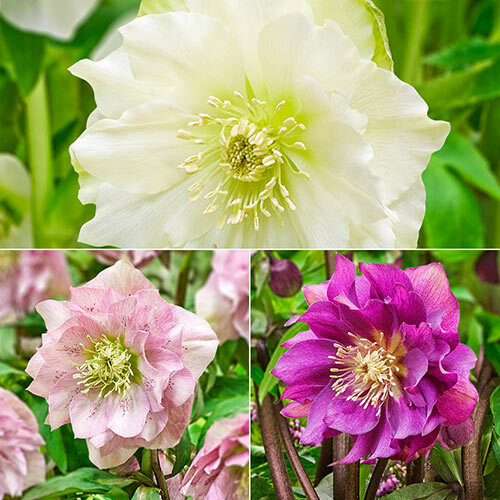 The van der Meijs family took what they learned from their cut-flower hybrids, and shifted their focus to Helleborus orientalis, a favourite species of hellebore gardeners. 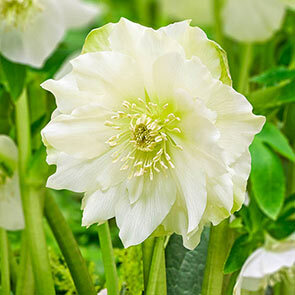 And now Breck's is proud to present this line of king-size hellebores to American gardeners for the very first time. Current breeding work is being done by Theo Janssen, who continues the legacy that Erik van der Meijs' grandfather started. The oldest plants in the van der Meijs nursery are over 40 years old and produce no less than 50 stems each! 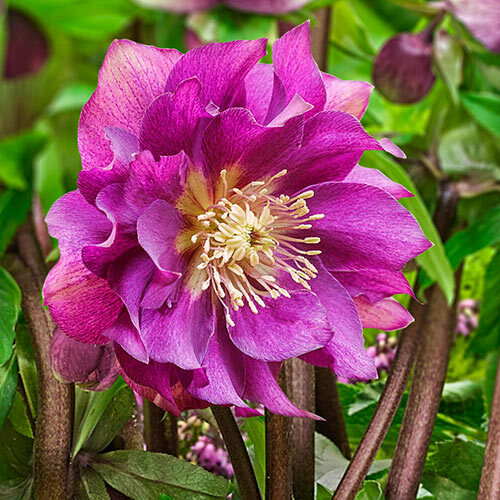 These intriguing varieties have multiple layers of sepals—adding marvelous texture to your hellebore display. Blooming as a trio, they'll create a cool ombré look in your gardens, containers and vases. • Blooms measure 4" across—up to twice the size of traditional hellebores. • Taller, stronger stems are at least 2' tall. • Upright blooms can be enjoyed from above. Flower Form 4" double flowers. Each bloom has 3 to 4 layers of petals. Foliage Type Glossy medium to deep green, leathery leaves divided into 7-9 toothed leaflets. Evergreen in warmer climates. Planting Instructions Dig a hole large enough to accommodate the roots without bending them. Plant the roots with the sprout(-s) just below the soilwithout bending them on soil level. Firm soil around roots and water in well. Pruning Trim back last year's foliage in late winter to early spring for a clean look.